I welded two shopping carts into one, added a chrome can crusher, and made custom cast aluminum grips, bumpers, and rims. I then used the cart to sort out recyclables from public garbage receptacles while talking loudly on my cell phone about business, golf, and wife troubles. In this performance I carried about four gallons of water on my head while wearing a business suit and carrying a briefcase. I filled my container at the bottom of Spokane Falls and then carried it barefoot over the rocks and up a very long set of stairs. I passed by a dam, went under a gondola, by city hall, through a mall, and then stopped at my luxury vehicle. I washed my vehicle with the water, and then drove away. This race held one of the largest bets placed between two citizens in American history. If the bum pushing the shopping cart won he would have received free healthcare, equal employment opportunities, greater educational opportunities, and a significant increase in compassion from the general public. If the businessman in his HUMMERH3 won then he would have received the amount of money redeemed from the cans in the bums shopping cart. It was a close race and even though the bum cheated, in the end of course, the businessman always wins. 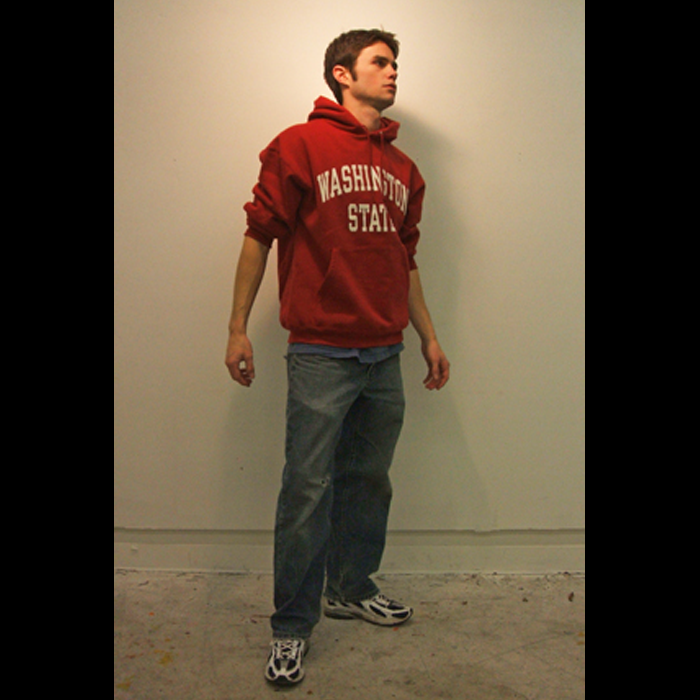 Dressed as an average college football fan, I took contents from a garbage can and spelled out "WSU". 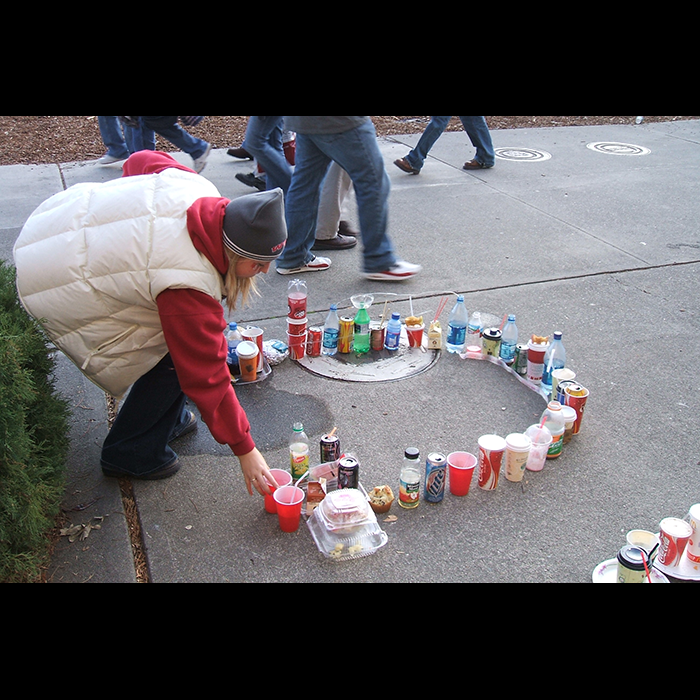 This took place outside the stadium as thousands filed in to watch the Apple Cup. The audience expressed intense enthusiasm, confusion, anger, and participation such as adding new garbage to the mural, taking family photos with the garbage, and eventually a police officer told me I was littering. This seemed particularly ironic considering it is customary for people to litter their garbage everywhere during the game. 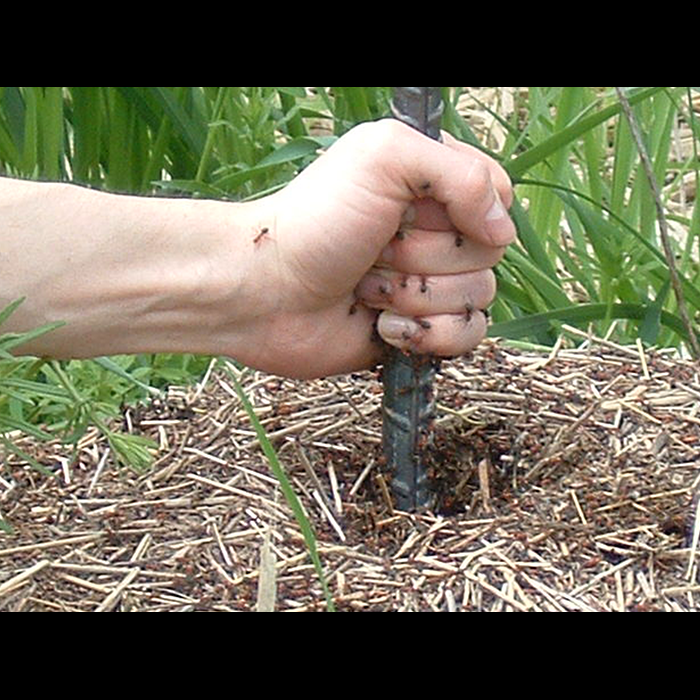 Stabbing re-bar into an anthill, then staying still and holding bar for 5 minutes.